One of the biggest and most valued elements of this particular mower is the intelligent design, which places it as a fantastic contender on the market against other models. The self-propulsion system ensures that you can go further from the house without worry for extension leads and a mains cord. This makes it a more desirable tool for both professional and domestic usage because it can be transported around with ease and is more versatile. This is further complimented by the four different cutting methods which are available on the mower. You can either cut and collect the cutting in the bag, cut the grass and then deposit the cuttings underfoot back onto the lawn, you can cut the grass and then turn it into much, and the grass can also be discharged from side ports on the mower. This allows for an improved versatility with regards to what happens to the waste from your grass, as some gardeners will be overjoyed to use it the excess cuttings as a form of natural fertiliser, as all the nutrients in the grass will be returned to the soil. 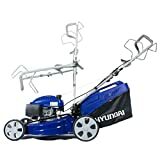 The model is a robust petrol lawn mower, with a four hp stroke engine to ensure that you can complete all tasks with ease, and the ergonomic handles allow for an improved comfort when operating the mower for extended periods of time. This will be of particular use to the more elderly gardeners who don’t want to stop tending to their gardens just yet but also find it hard to work for extended periods of time. There’s a generously sized 70-litre collection bag included with the model, which saves you trips to the bin and thus time when performing larger tasks with the mower. As well as this, six different cutting heights are incorporated in the design, which gives you an improved level of control over the length of your lawn. Overall, with all the great features available with this model, it is evident to see why this is a strong contender against some of the other best lawn mowers on the market. The powerful engine and intelligent design work in tandem with each other, and the four in one system and the adjustable cutting heights give you a superior level of control over your mowing than other models might. With the intelligent and reliable design, it’s clear to see why this model will earn it’s place time and time again within the arsenal of any experienced gardener, taking the rightful place among the other prized and trusted gardening tools.